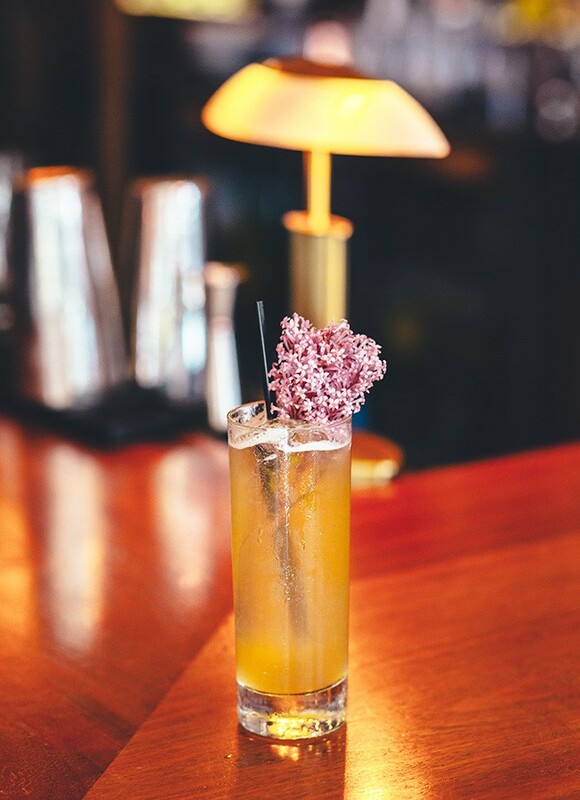 After being challenged by Sammy Faze of the Drinkingbird and Billy Sunday to make a cocktail using grass, Brett Lichnerowicz of Luxbar did some urban foraging in people's yards "with or without their permission" to find some for his experiments. "There's so many varieties of grass—there's ryegrass, fescue grass, sweetgrass, bluegrass." Once he'd retrieved some samples, he says, "I steeped, I cooked, I pulverized, I muddled, I chewed. They all kind of taste like a green tea." He ended up using several in a simple syrup—lemongrass, ryegrass, and fescue grass, along with coriander, dandelion root, and burdock root—that "has a very strange flavor, like a green tea-lemon-poppyseed taste." Żubrówka bison grass vodka was a natural choice for the liquor, which Lichnerowicz combined with lemon juice, for brightness, and rhum agricole (cane-juice rum), to add "a fig jam essence." He also made a tincture at home with "another kind of grass that may or may not be legal in the state of Illinois," adding a few dashes of that to the drink, then finishing it with Allagash's Little Brett beer. When it came to naming the drink, though, Lichnerowicz had some trouble narrowing it down: after considering candidates like Mowin' and Flowin', Greengasm, Enviralicious, Chuck Grassley, Blade Runner, and Grassmaster Flash, he finally settled on Through the Looking Grass. Combine all ingredients except the beer and pour over ice into a Collins glass; top with beer. Who's next: Lichnerowicz has challenged Jenn Fink of Pub Royale to create a cocktail with apple cider vinegar. Watch Jenn Fink of Pub Royale create a vinegar cocktail with a bite. Challenged to create a cocktail with squid ink, Sammy Faze of the Drinkingbird embraces its oceanic elements. A drink infused with shredded gum brings a bartender back to his childhood. Challenged to make a drink with marine algae, Roger Landes of MFK pairs it with bourbon. Absinthe has nothing on Zubrowka, also known as bison grass vodka.